FACT: The President of the United States, the Senate, and some state legislatures, governors and mayors have the authority to declare a commemorative event or day by proclamation. Petitions are introduced by constituents or trade associations to honor industries, events, professions, hobbies...AND FOOD! After the observance day is authorized, it is the petitioner's responsibility to promote it to the public. CTbites was not the petitioner, but is excited to promote National Oyster Day on Tuesday, August 5th...a day eagerly awaited by mollusk lovers throughout CT.
Today, iced cold oysters are the perfect summer food...high in protein and low in calories. There are over 150 varieties of oysters, but only five species, each traditionally named after the body of water or bay where they are grown. Varieties are known by a myriad of names such as Wellfleet, Blue Point, Kumamoto and Kuushi. The flavor varies by the conditions or Terroir they are grown in; rocky soil, tidal or brackish water, etc. with the Northeast areas of Massachusetts, Rhode Island and Maine providing some of the most delicious and accessible oysters. The Whelk proudly serves some of the best and freshest oysters in the area. Its menu lists 10-16 different varieties, and new oysters are offered every 2-3 days depending on availability. Chef Lazlo sources his oysters from small oyster farms as far north as Nova Scotia, and as far south as Virginia. He looks to present a variety of flavors. Between 1500-2500 oysters leave the Whelk's kitchen each week, either served raw on ice, garnished with seaweed and lemon, or fried, resting upon their popular Green Goddess Deviled Eggs. For our sampling, Chef Lazlo selected a platter of four varieties of oysters. When I asked whether to top with the mignonette or cocktail sauce he smiled and responded, "Neither"...a true oyster lover savors the flavor of the oyster and its liquor without distraction. Equally important is the method of eating. Oysters should be slurped in one intake by holding the narrow end. The salinity, the texture and flavor notes are all part of the experience. Chef Lazlo walked me through each of the four. Each presented an increasing level of salinity and were very different in complexity. The "Cedar Island," from Point Judith, RI offered a mild taste and softer texture. The second selection, "Chatham," from Chatham, Ma., delivered a sweeter taste and a firmer texture. 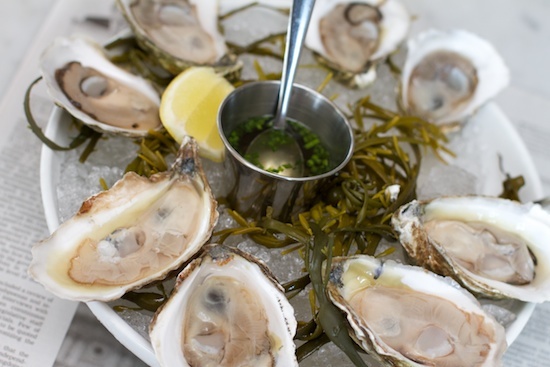 This Cape Cod oyster is farmed from Wellfleet to Buzzards Bay and is among the most popular and widely distributed and one of Chef Lazlo’s favorites. The third oyster was from Pope’s Bay, Virginia. The "Misty Points" originate in warmer waters resulting in a stronger, almost gamey taste, further enhanced by its liquor. The last was a "Basket Island" from Casco Bay in Maine. This oyster delivered the greatest salinity, as Chef Lazlo quickly pointed out. He also mentioned that this particular bay off the coast of Portland is also a big producer of Maine lobsters. Also included on the menu are several local favorites, including Norm Bloom and Sons' "Copps Island" oysters farmed off the Norwalk Islands. These traditional Blue Point oysters offer the largest oysters and are also those perfectly fried beauties sitting atop the deviled eggs. Chef Lazlo was a great teacher as he walked me through the different oysters. When you go to The Whelk make sure you study the offerings on the left side of the menu and ask your server for recommendations...and forego the lemon and cocktail sauce and slurp slowly and savor every bite. It is worth it.